Need a favour? Ask Alfie. Alphie (Alphonsus) Lambe was a native son of our diocese of Meath. Little known outside of his native Ireland and Latin America, where he “fought the good fight and finished the race” (2 Timothy 4:7), Alphie — or El Corderito, the little lamb, as he was known by his Spanish–speaking friends — ranks with laymen like Blessed Pier–Giorgio Frassati (1901–1925) and Blessd Ivan Merz (1896–1928) as a model and intercessor for Catholic young people, and especially for men in their twenties and thirties. The following article on the life of Alfie Lambe was written by Noel Lynch, former Legion of Mary envoy to South America. Alfie Lambe was a typical youth of his time in Ireland and always showed great devotion to Our Lady. He entered the novitiate of the Irish Christian Brothers at a very early age and showed all the signs of making an excellent religious but for one fact, his health. He was asked to leave because of recurring fainting fits. As Frank Duff said later. His departure from the Irish Christian Brothers was the last time he had a fit, the Brothers loss was the Legion’s gain. When he returned home to Tullamore he was devastated as his dream of being a religious had been shattered. One evening his bother Jack invited him to his Praesidium meeting and as Jack recalled many times, this first encounter with the Legion set him on fire. He was barely 18 years of age. In a very short time he was committed fully to the Legion and would do more than the 2 hours weekly work. His extra hours were dedicated to prayer and the setting up of the Legion in rural Ireland. His sister Kathleen often would confide to legionaries that he would set off on his bicycle early on a winters evening and return near midnight soaked to the skin and very little to show for his efforts. However the next night he would go off to another parish to do the same. Alfie saw in the Legion Our Lady’s apostolate to her children. The Legion was Mary in action. He moved to Dublin and with the help of many good legionaries blossomed in his efforts to work the Legion system and set up new Praesidia. Not all Dublin legionaries recognized his potential but those who did knew that great things were ahead of this young legionary. When Alfie heard that Seamus Grace was going as envoy to South America he offered his services to assist him and to his sheer joy they were accepted. He was sent as a helper and assistant but ia very short time he was working on his own and travelling from one county to another in that vast continent. What congregation in the Church would send a 20 year old with just 2 years experience to take on an entire continent. This is exactly what he went out to do and did. At this point it would be good to relate some experiences Alfie had with priests in Latin America….. His respect and reverence for priests was outstanding and he always greeted them with their full title, not often used in Spanish, Your Reverence. Most of the priests were just waiting to start this new association and welcomed him with open arms. Very few opposed his work but even those who did were eventually won over by the absolute respect they saw he held for the priesthood. Alfie had an exceptional interest in seminarians and was inspired by Saint Patrick’s way of forming of future priests. He did not give the seminarians lectures on how to organise the Legion apostolate but brought them with him in teams to set up new Praesidia, visit older ones and do Legion work with local legionaries. 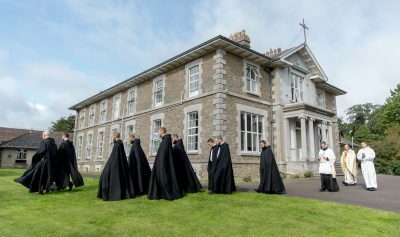 The rector of a seminary offered Alfie 14 seminarians for a fortnight. Word had just come in that another diocese had opened to the Legion and Alfie took the 14 on the long train journey to that diocese. In the carriage they were travelling in he set up a miniature Legion altar and held a Legion meeting with the seminarians and assigned them to go in pairs to contact their fellow passengers on the trains. On that train journey 3 meetings and 3 sets of Legion work were done and on arrival in the dioceses the seminarians, with Alfie’s help, set up many new Praesidia. Bishops and priests would ask Alfie’s advice on many spiritual matters and Alfie would always bring them back to this central theme, Mary’s motherhood of souls and their privileged priestly participation in that motherhood. He convinced priests that often they would not wait for a team to set up the Legion in their parish but would start it themselves. Many missionary priests would do the same in the villages where no priest was resident. One such village was Chicoana. On learning the Legion from Alfie and with one Handbook a missionary set up a Praesidium. Two years later some legionaries went to see what had happened. The Praesidium with no contact or help from outside had survived and had 170 active members. Alfie had a special gift to get people to do things they thought they were incapable of achieving. He worked with rich and poor, young and old. He always asked and expected great things from people. When starting a new Praesidium he would ask them where was the most difficult area in the parish. Who was the most difficult and impossible case. Then he would tell them now you will see how Mary will use you. In another city he wanted to introduce the legionaries to the work for the street girls. The new legionaries, who were naturally afraid of embarking on such a venture replied, ”We do not have that problem here” That night Alfie got into a taxi and in a very broken foreign Spanish accent asked to be taken to a brothel. When he arrived he said, don’t like that one take me to another. Next morning he had a list of addresses for the legionaries to start that work. After 6 years of non stop apostolate and setting up the Legion in more than ten of the Latin American countries signs of ill health began to manifest themselves. His luggage contained different painkillers and it was thought that he was suffering from stomach ulcers. He was operated on which revealed that all his major organs had cancer and within 10 days died a painful but saintly death. The example of his short like inspired thousands of legionaries. When the news broke that he was seriously ill many legionaries offered their lives to Our Lady in exchange for his so that he could continue his work. God had other plans and on the feast of Saint Agnes [whose name also means lamb] 21 January 1959 at 6 a.m. Alfie Lambe died. The Irish Christian Brothers in Buenos Aires offered their vault and that is where his remains rest. His grave is a centre of great pilgrimage and devotion. What happened after he died could be compared to the Little Flower who promised she would shower graces from Heaven. Many of those who offered their lives went on to do long term and full time extension work. The summer period following his death over 200 legionaries went out and set up new Praesidia all over Argentina. The devotion to Alfie grows especially in South America as does the Legion. All age groups, but especially youth, have been inspired by him to do great things. At this present moment there are two Argentinean legionaries working on full time extension, one in Kazakhstan and the other in Bolivia. One of the ideas of the Legion Handbook is that a legionary most always be on duty. Alfie taught by example. One day Alfie met a young man in a railway station. With a smile he asked him would he like to do something for Our Lady. The young man answered that he would but that he did not go frequently to Sunday Mass. Alfie replied; “I did not ask you about Mass but would you be willing to work for Our Lady”. That same week he attended his first Legion meeting. Within a few weeks he was an officer of that Praesidium and soon after became officer of his Curia. Within a few years he went for the priesthood and to day is rector of the diocesan seminary. Alfie had made plans to return to Dublin after 6 years in Latin America. His proposal to Frank Duff was that he was willing to go to extend the Legion in Russia and he had not only learned the Russian language but had worked out how he would enter the Soviet Union and also communicate in coded correspondence with the Concilium in Dublin. Like many of the saints it is hard to penetrate the depth of his spiritual life and not too much can be said about it. However Alfie had this deep active devotion to Mary. He was never known to have anything but a smile and good humour in spite of the fact of travel and conditions that would have exhausted his frail body. He would renew his Legion Promise to the Holy Spirit very frequently and his bedside companions were the gospels, and St. Louis Marie [de Montfort’s] True Devotion to Jesus through Mary. He made a point of keeping in contact with a huge number of people and aimed at writing at least 3 letters each day. These letters, like the spiritual advice he gave, were treasured by those who received them. A few days before his death a nurse commented on the fact that he said many rosaries. She said to him; “You are an extraordinary Catholic”. His reply was;” Oh no, I am only a very ordinary Catholic”.